The Western Australian branch of the global Konecranes organisation has been declared the best service branch in the world. Konecranes is a world-leading provider of overhead cranes and lifting equipment. The honour for the WA branch came at this month’s annual conference for being Konecranes’ top performer, which according to Konecranes National Sales and Marketing Manager Warren Ashton is a major achievement since the company employs more than 10,000 people across 370 branches in 43 countries. 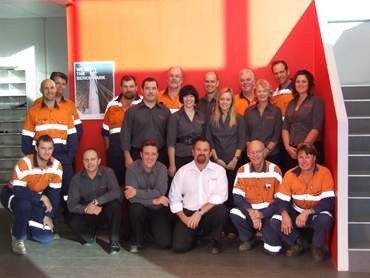 Konecranes’ Western Australian operation, whose team of more than 80 staff is headed by District Manager Aaron White was presented with the award this month after it grew more than 100% in the last year by focussing on key performance indicators such as customer service, staff development and safety. Mr White said his team was judged on five Key Performance Areas: customers, people, safety record as well as growth and profitability. He attributes the branch’s top performance to his team. Konecranes believes in dependable, empowered and knowledgeable people working with superior equipment to deliver outstanding service, a formula that has won them extensive business in areas such as mining and petroleum resources, infrastructure, ports as well as onshore and offshore fabrication and service markets. Konecranes’ activities in Western Australia encompass the sale and maintenance of light and specialised lifting systems including the new XA aluminium types and safety-focussed chain hoists as well as large cranes used by heavy industry with capacities of more than 210 tons. Konecranes recently met the challenge of a BHP Billiton initiative intended to bring the mining conglomerate’s cranes and hoists at its Port Hedland iron ore facility up to a higher safety standard compliance level, in accordance with its Fatal Risk Control Protocol (FRCP) 10. This gave the WA branch the opportunity to work alongside their customers and deal with cranes of all brands and types. Konecranes is a world-leading provider of lifting and maintenance solutions, with a track record in pioneering, leading and shaping developments in the industry.